Everyone else does monthly favourites, here I am writing about my most disappointed products this month. There's nothing worse than spending money to be disappointed and for it to be sat in your makeup bag, especially if you've paid a lot of money for it. So here I am warning you that these products weren't for me, so they may not be your cup of Rosie Lee (cup of tea) either. Although everyone has different tastes and opinions so just remember that. Firstly is this No7 Protect and Perfect Beauty Serum. Let's just get it out there, I'm not a fan of serums for my face. For my hair yes definitely! But for my face not so much! I just don't see what they're for or how they can benefit my face. But I was given this to try off my mam who didn't use it either. Yeah I know it's for wrinkles so what difference am I gonna see if I don't have any. But surely it has got to do something? Anyway, it done nothing and I don't even no what I was expecting it to do but this or any other serum isn't for me. Next is the Max Factor Excess Volume Mascara*. I was so excited when I was sent this product because I am one of those people who see the price tag of the Max Factor Mascaras and get scared as they're quite expensive. And with mascaras I like to buy a new one every time as I live trying something different. 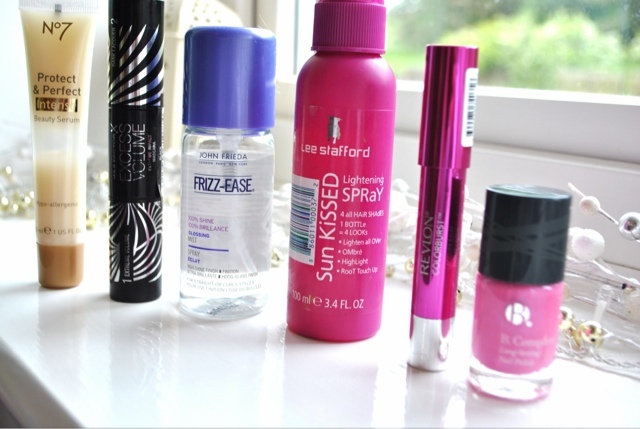 They always look so good but I've only tried them when they're on special offer in Superdrug. So when I seen this had two wands I was over the moon as I normally end up using two mascaras anyway, so anything that helps make my makeup bag lighter is a winner. Yes it was good, yes it made my eyelashes look good. But the thing that put me off BIG STYLE was the fact that it is an absolute nightmare to take off. When you come home and are taking your makeup off you normally are knackered and just want it all off and to snuggle up in bed. Well this took a good 10 mins to get off. I went in with my usual makeup wipe for my eyes and it wouldn't even budge. I felt I was pulling a tonne of my eyelashes out whilst trying to get it off. So I haven't even used this again because of this problem. Maybe if you do use a separate eye makeup remover the. It might help but I don't and don't want to change my routine just for a mascara. With blonde hair, especially dyed blondes, you will do anything for a bit of shine. It's hard to get that shine without it being greasy. So I seen this John Frieda Frizz Ease Glossing Mist and stuck it in my basket because I love John Frieda Haircare so trusted them. Sprayed this on my hair and didn't like the way it was. I felt it kind of made my hair crispy. I suppose it's a bit like a dry oil spray but i just didn't like it at all and I felt my hair wasn't shiney. Oh Lee Stafford how you've let me down. 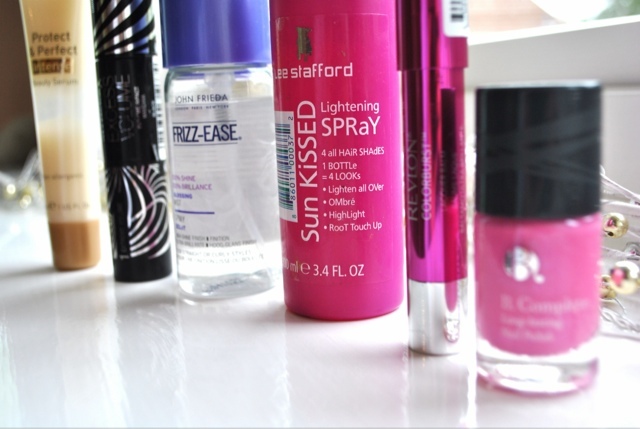 When I blogged about this I told you all how I was curious about this Lightening Spray. It was meant to lighten my roots but it done NOTHING. Nothing at all. I even done it when I was on holiday and yano how when you put lemon juice in your hair and go in the sun well I though it was like that so I used it in the sun but nope. Like I wasn't expecting it to dye my roots but like c'mon. This is just a useless product which dorm zilch. If only I'd have listened to myself and saved £6. If you tend to read a lot of blog and follow them then you would have seen a few of these kicking about and that's the Revlon Colourburst Lacquer Balm*. I have it in shade 115 whimsical fantaisiste and was sent this in my winners goody bag by Superdrug. I have been dying to try them, honestly I was so excited to see this. Tried it on and didn't enjoy it. I don't know if it's the colour or what but I just didn't like it and it was such an anticlimax. It must be the colour because I still think they must be good just because of other blogger raving about them but I've just got the wrong shade. It's just too clear for me with a tiny bit of colour and it takes a few good tries at applying it to build up some sort of colour. And finally this is another product I have been sent which is the B.Complete Long Lasting Nail Polish in 145 Bubble Gum. I'm liking the B. Range lately as their B.Sculpted kit is good. But this was a let down. It's too watery, the brush is too thick and the colour just seems cheap. It's like a one that you'd get from the pound shop and you've got to apply it at least three times to have a good coverage. That's all for May guys. I just want to say I'm not ungrateful by posting products that I have been sent as they just weren't for me and I want to give my readers the truth. I have been sent these to see if I do like them but unfortunately I don't so I'm not going to lie just so I get free stuff that's not what I do it for. Any of these products that you guys actually like?